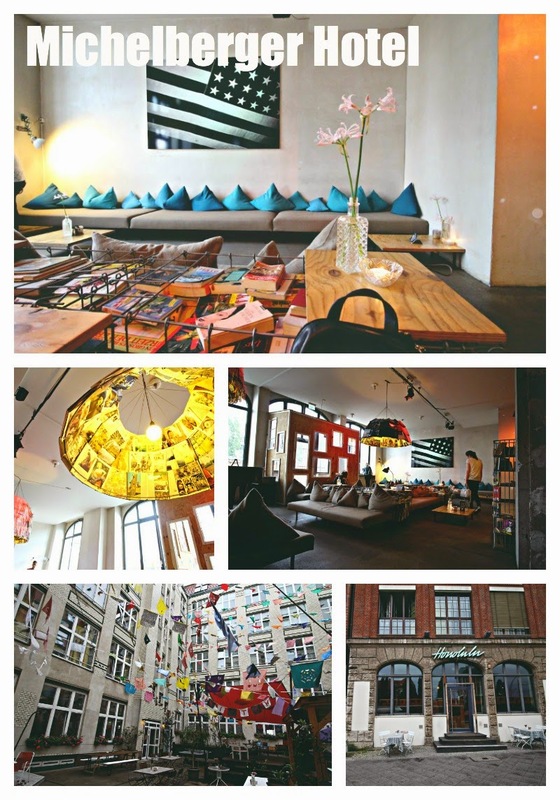 We've heard a lot about the Michelberger Hotel in Berlin and made sure to hit it up during our trip. 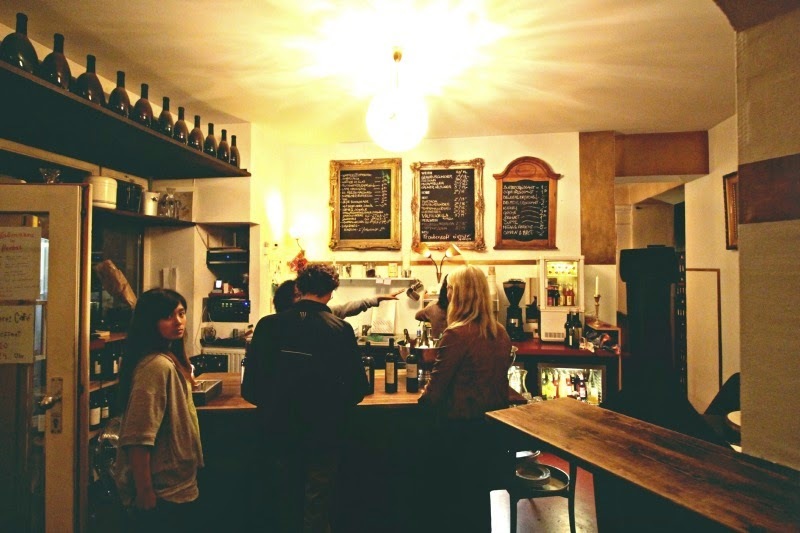 It's in the lively Friedrichshain district of Berlin. 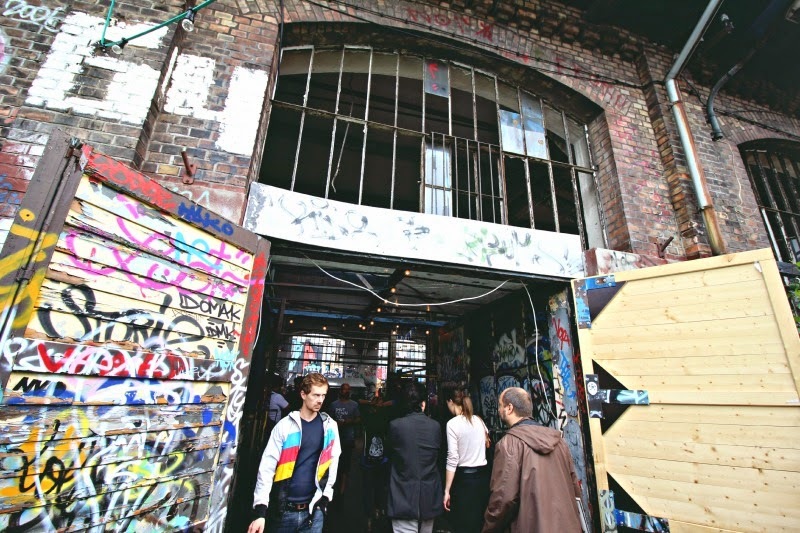 This area is way hip and super built up, it still has the vibe of being an area full of squatters and artists. Both grungy and artsy. This hotel's lounge area was the perfect place for Nat and I to make a pit stop to regroup after our long walk along the Berlin Wall. 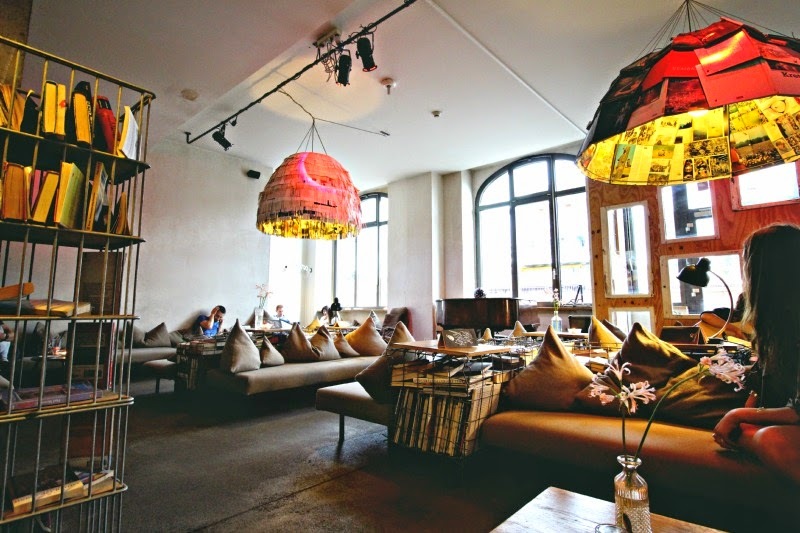 With interesting and imaginative design including layered stacks of book next to the seating areas, the Michelberger Hotel is a feast for the eyes. The inside bar/restaurant, Honolulu Bar, serves delicious organic food, as well as the famous Fountain of Youth drink, fresh coconut water straight from the palm tree. It will blow your mind! We randomly walked by this super cute crepes and Belgium waffle place on the way to a wine bar we wanted to check out, and instantly fell in love with this Kaug Dich Glucklich. The candy-colored chairs outside are super inviting, and the inside is just as lovely. 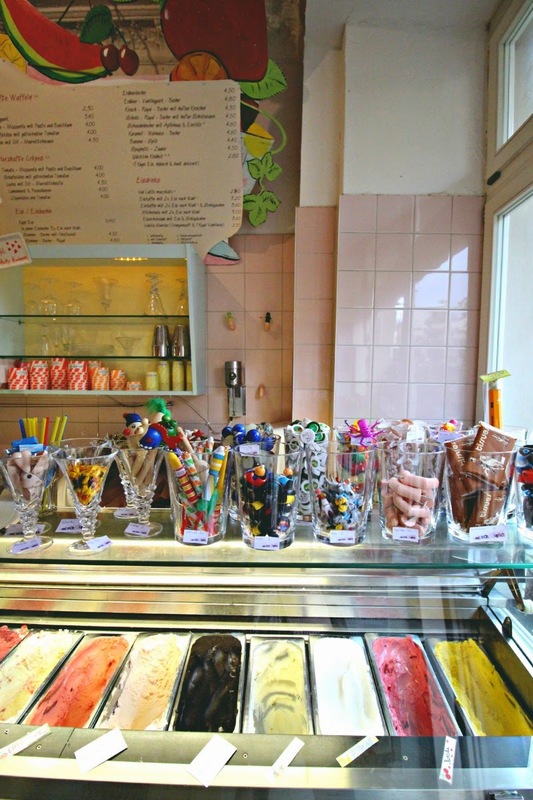 But really, no sweet tooth can deny how delicious the treats are here! We decided on the spot to share a waffle and a crepe for dinner that night, followed with wine down the street. The portions are huge and the toppings are warm and generous. We were drowning in sugar love all evening. 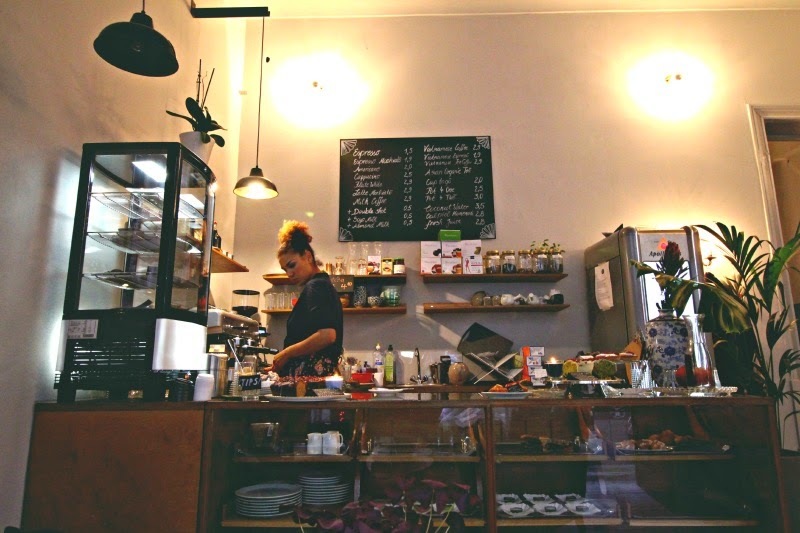 There really are small wonders everywhere you go, like this little hole-in-the-wall coffee shop and bakery in the heart of Kreuzberg, the hip and vibrant epicenter of creativity in Berlin. This Asian coffee shop is nothing like what you'll find in your everyday Chinatown. It's super quaint with pops of pastel colors in the corners. 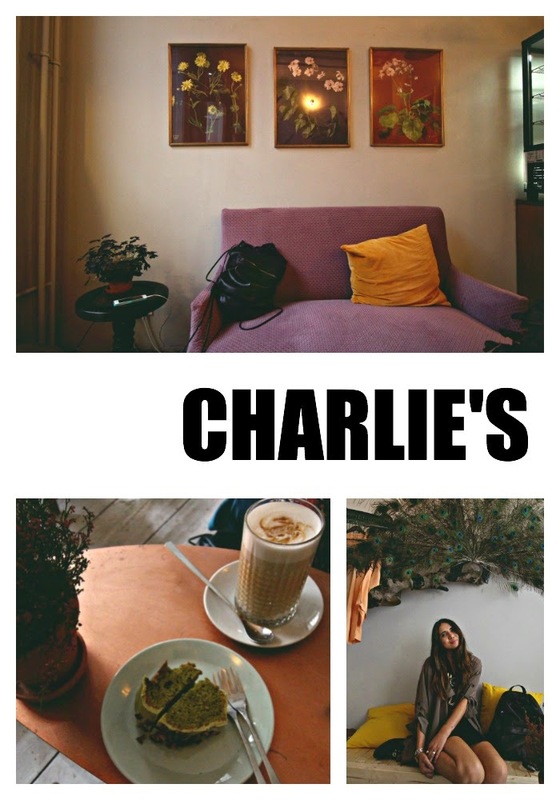 We chowed down on some Matcha green tea cake and Vietnamese lattes over the latest in Berlin fashion magazines before venturing on. What's also awesome about this place is that it also has a mini shop in the back where you can purchase gorgeously dyed kimonos and other lovely knick knacks. 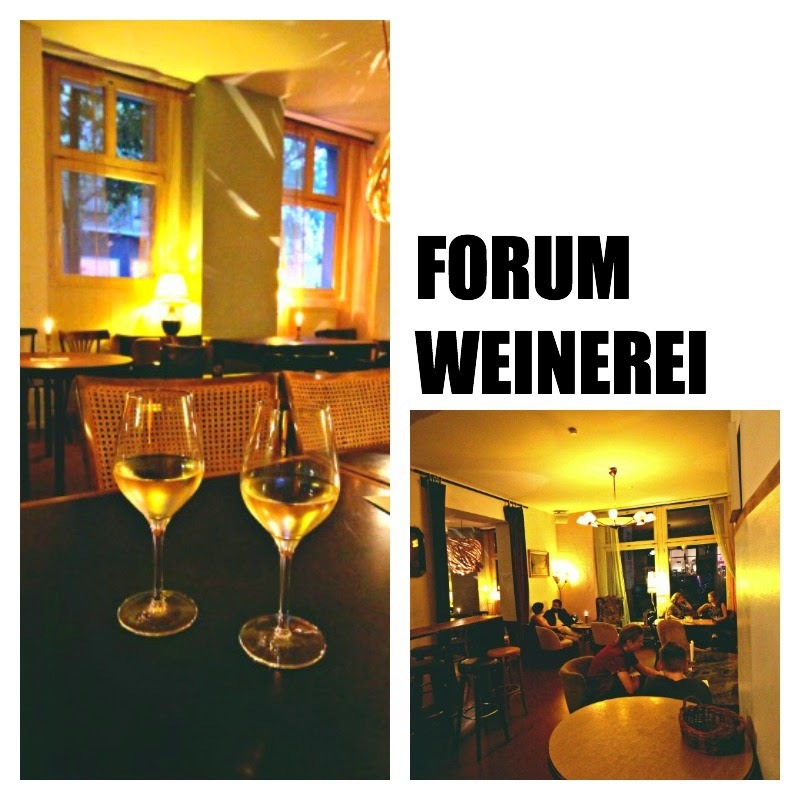 We were looking for a casual and relaxed place to get some wine, so after a quick dig on the Internet, I found out about this place that had an evening long wine-tasting every night. For 2 euros, you can get a glass of wine and feel free to help yourself to a plethora of different wines to drink throughout the night. When you are done, just leave a fair amount to cover what you think you drank. It's actually a sweet deal! The inside is warm and inviting, dimly lit with interesting art pieces hanging from the ceilings and covering the walls. 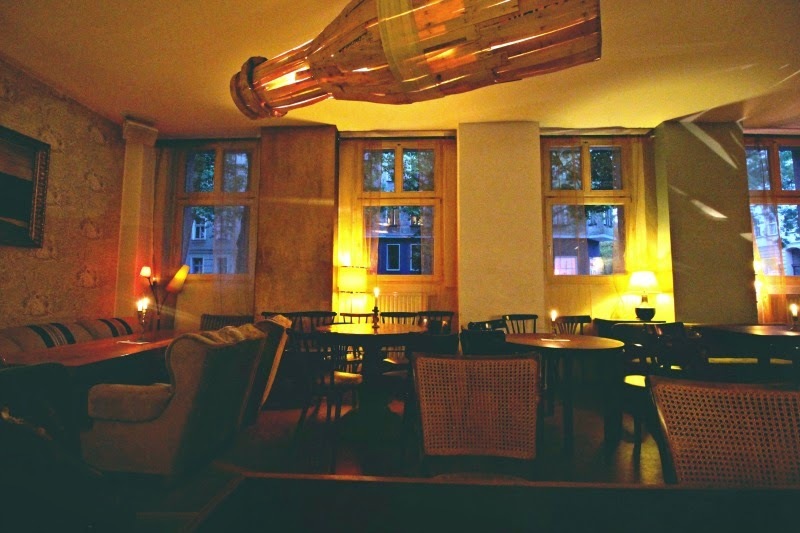 It's very classy, but this is where all the cool kids hang for a chill night in Berlin. 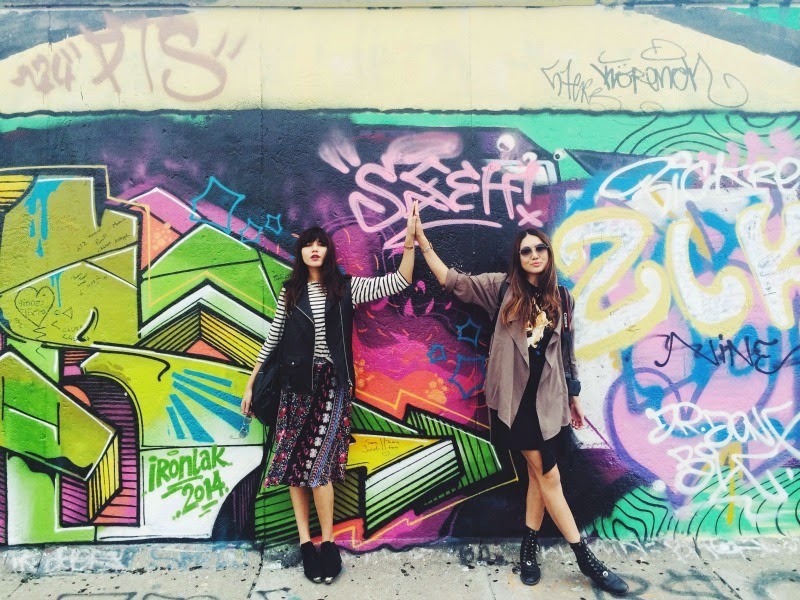 It was hard for Nat and I to choose which neighborhood we liked better, Kreuzberg or Friedrichshain. Both border each other, and have similar vibes, but guess you can say that Friedrichshain is a little bit more grown up. 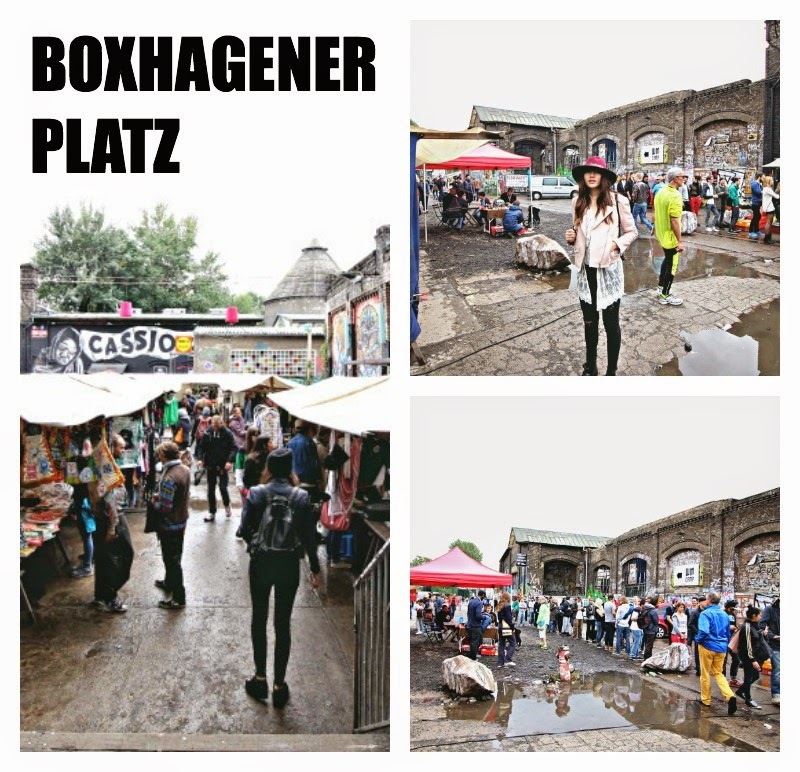 It has Boxhagener Platz which puts on an awesome flea market on Sundays. This is the place to go for some souvenirs to take home with you, as well as some sweet vintage deals. Simon Dachstrasse is a street close by that is every food lover's dream. 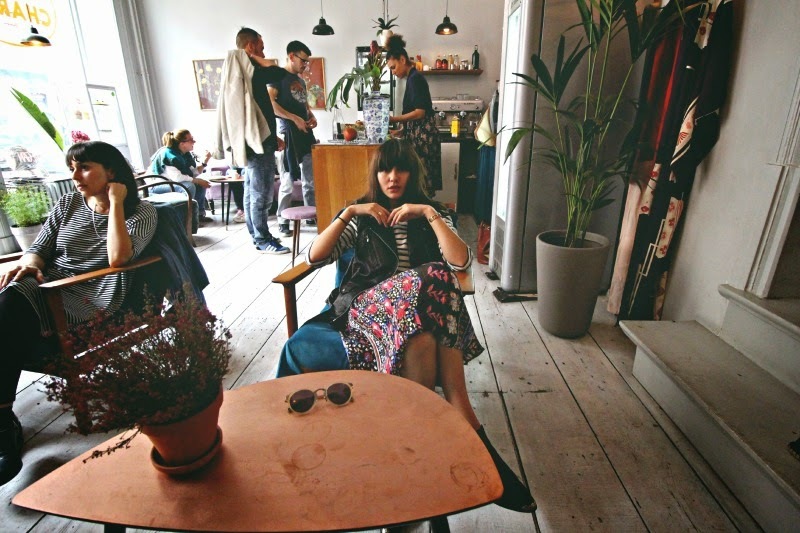 Filled with quirky shops and great people watching, Friedrichshain really made a great impression. 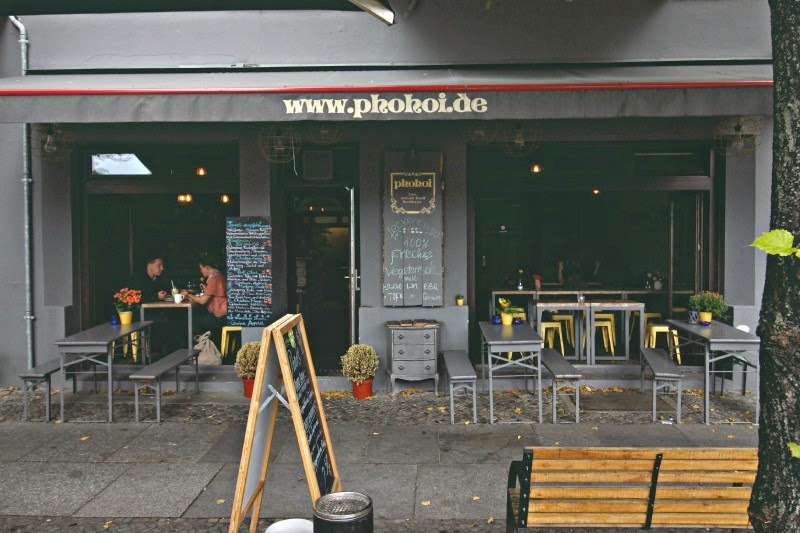 When in Berlin, eat . . . Vietnamese food?!? Why, yes, of course!! If you guys follow us closely on social media, then you know how much we crave a nice big bowl of pho soup on the weekly. 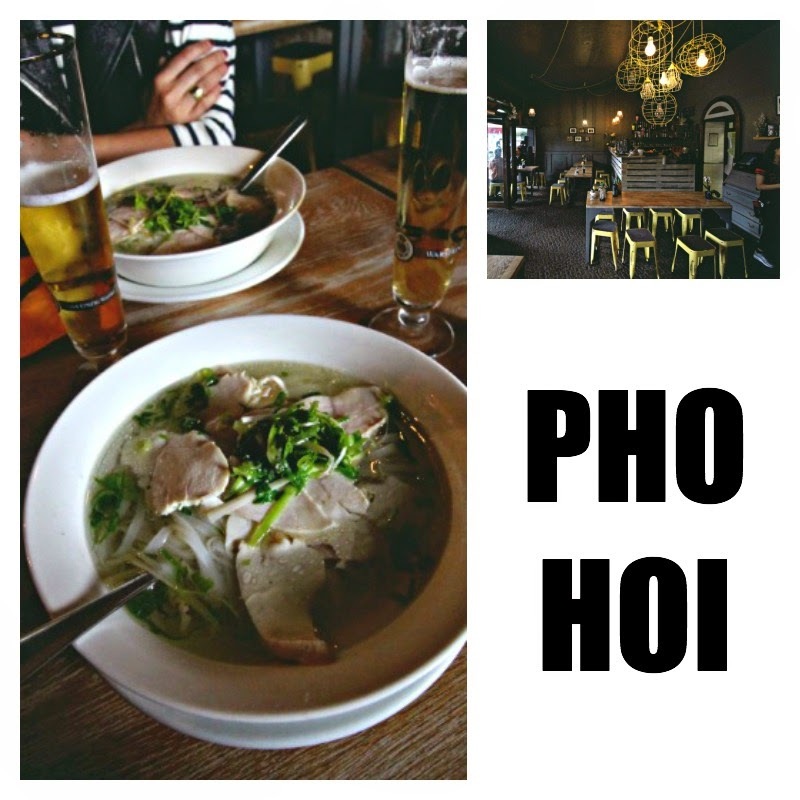 It was a slightly rainy day in Berlin, and Vietnamese sounded like the best thing to keep us cozy until it passed. The food was authentic and the portions were generous, and the little yellow stools we sat on were quite charming. What I love most about Berlin is all the food options you can find in such close vicinity to each other. Berlin is a city that thrives on its mix of culture, and getting the chance to eat our way through it was a divine experience. 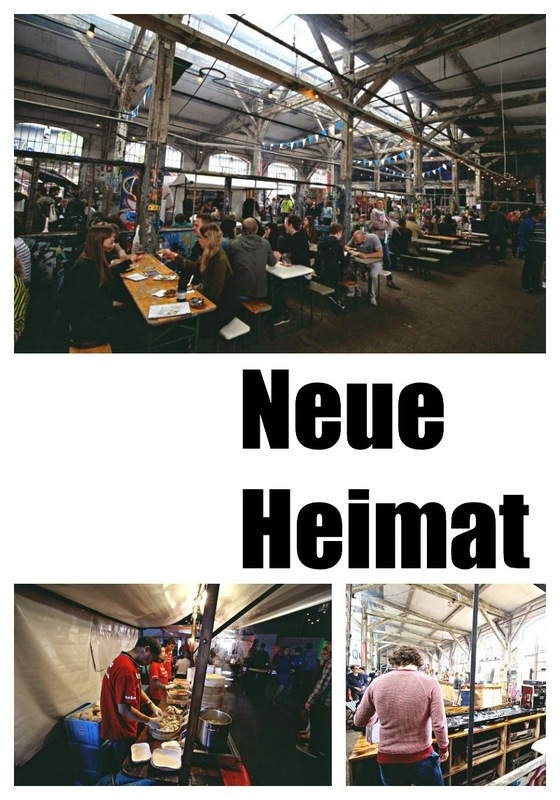 Right next door to Boxhagener Platz is the amazing and mind-blowing Neue Heimat, an indoor food market every Sunday. Coming from Brooklyn, I have become quite familiar to my neighborhood's plethora of food markets and festivals, but let me tell you, they never get old. And I'm not going to lie, I'm pretty sure that Berlin's version of Smorgasbord gives Williamsburg a run for its money. Taking over what seemed like two large buildings, Neue Heimat was filled to the brim with delicious things to nom nom on from all over the world. 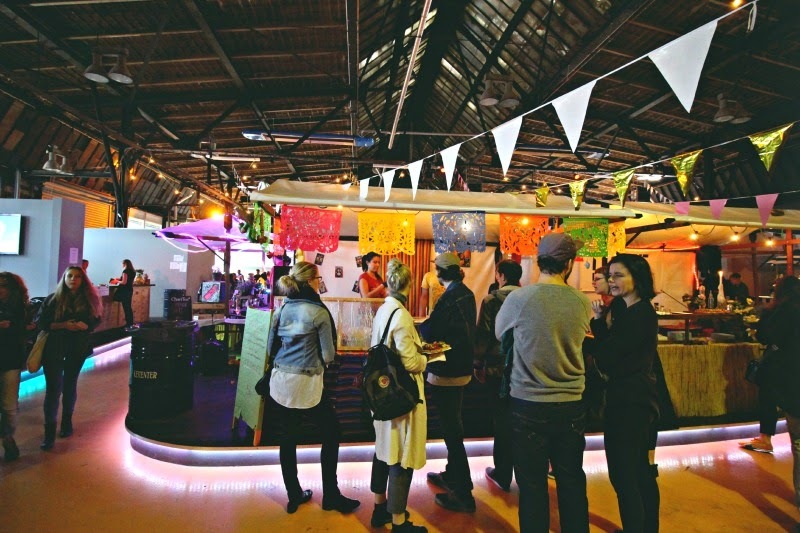 Today, trendy is non-traditional, and Neue Heimat is just that. You can find just about any sort of fusion combination here to go along with a wide variety of beers, of course. Hey, this is Berlin, you have to drink beer with everything. 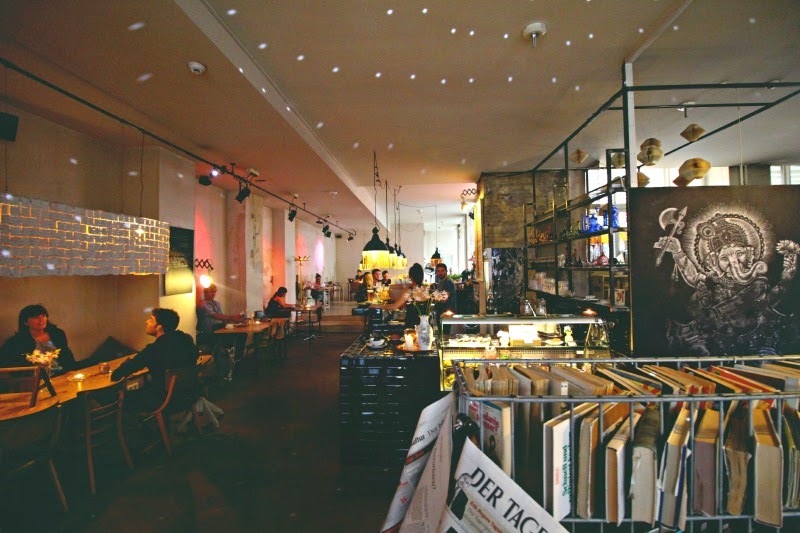 If you are visiting Berlin, make sure to keep a Sunday afternoon free to take in everything Neue Heimat has to offer. Your stomach will thank you! Oranienstraße in Krezuberg is where it's all happening in Berlin. 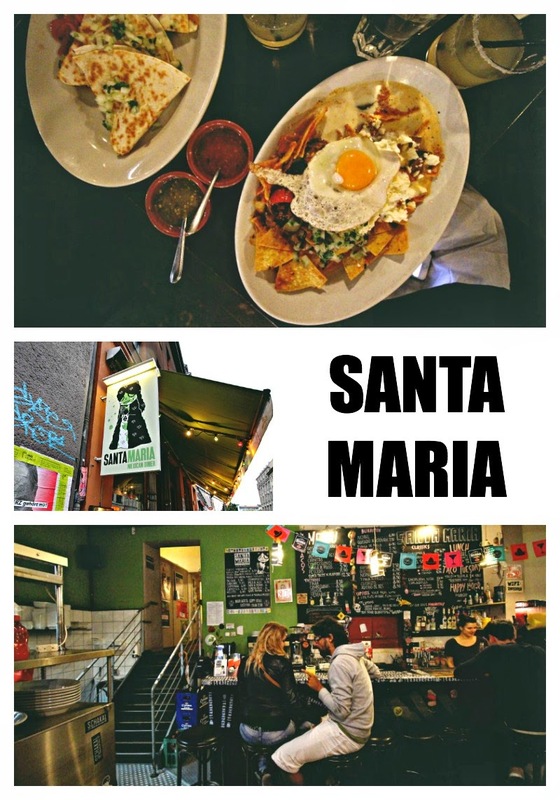 Coffeeshops, bars, clubs, restaurants, vintage shops, etc. can be found all along this street and the surrounding area. It reminded me so much of the East Village in NYC, except even more hopping if that is even possible. We walked by this place with hipster kids eating huge plates of delicious looking Mexican food and knew we wanted in, so we made plans to get dinner there the next day. Our last night in Berlin was rainy and completed with a Mexican feast. Eggs on our nachos?? Um, YES, please. 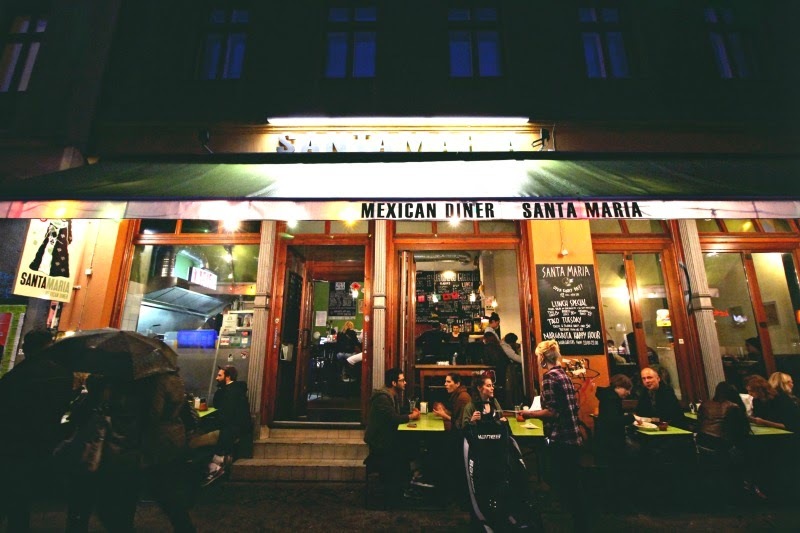 A taste for Mexican food is in my blood, and I was pretty stoked to find out that one of the best places to fulfill my love for it would be in Berlin. 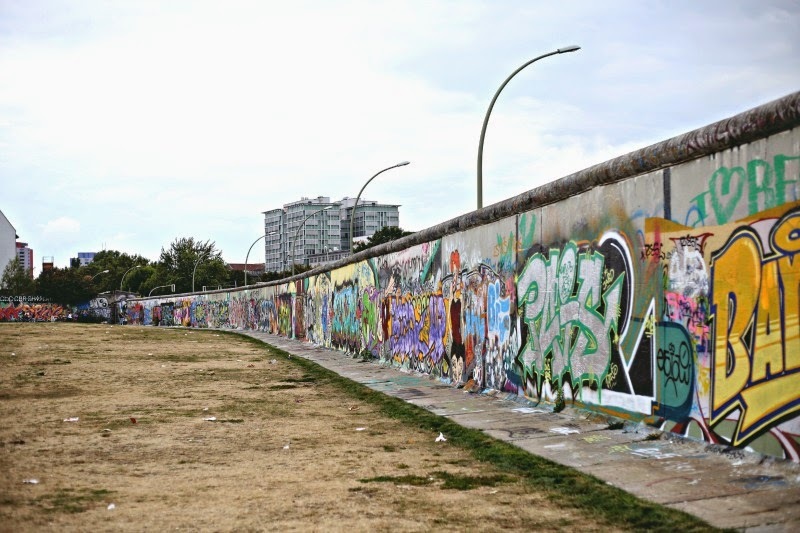 Berlin is full of history, and the Berlin Wall is a major part of Germany's past and the years ahead for the country after it was partially taken down. 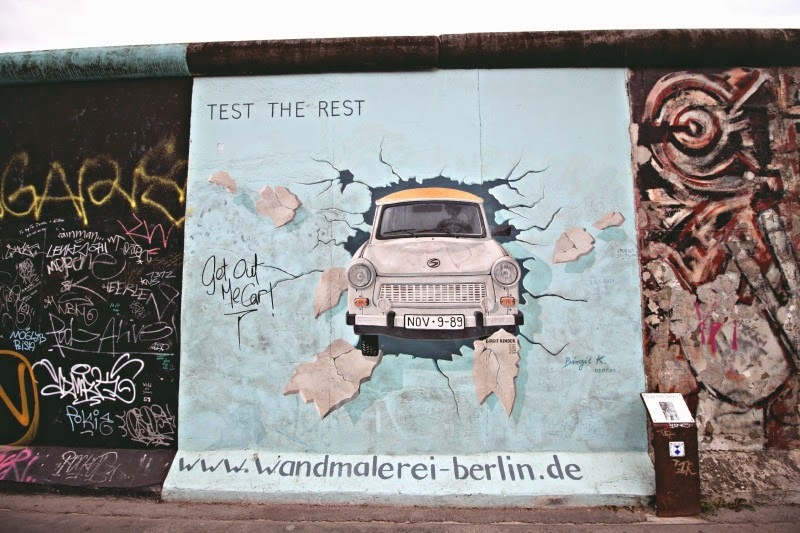 Today, what is left of the original Berlin Wall is known as the East Side Gallery, running along the border between Kreuzberg and Friedrichshain. Today, each part of the wall is covered in artwork and graffiti, the majority of which make political statements and/or create visions that force you to tap into your imagination. It really is amazing how many stories the wall tells. It's the heart and soul of the city. An expression of freedom. You can tell that Nat and I are definitely New Yorkers is because we live off bagels and try to scout them out on the regular. 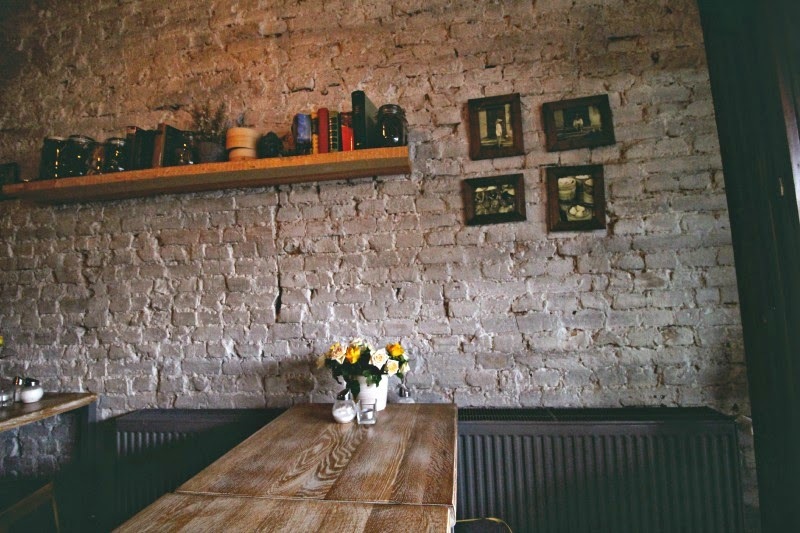 So leave it up to us to find somewhere to get our bagel fix all the way in Berlin. 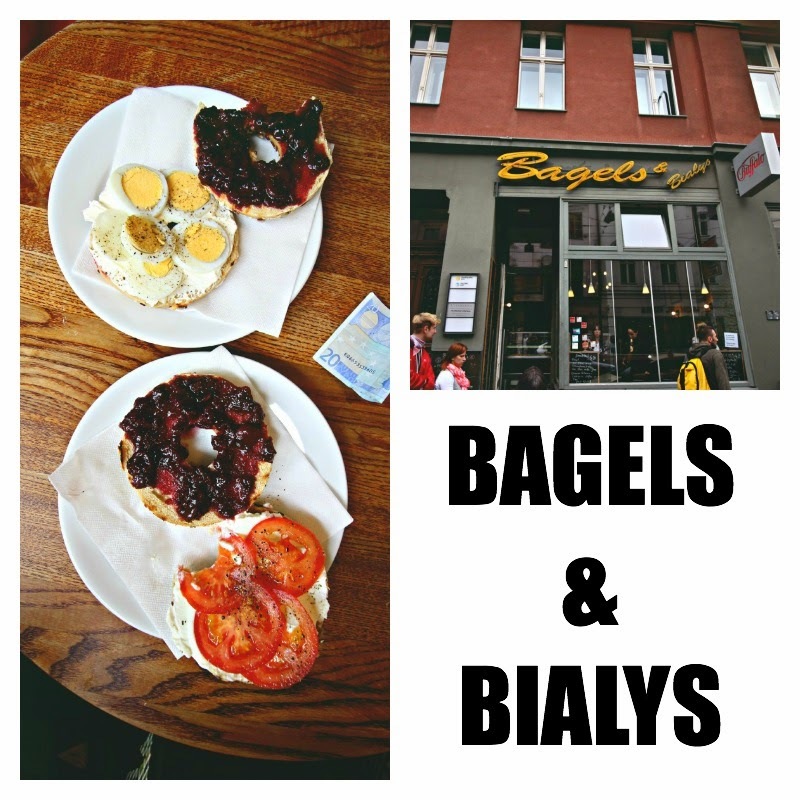 Bagels & Bialys is apparently a household name in Berlin's Mitte district, and for good reason. Toppings for you bagel are always fresh and there is no such thing as a combination that doesn't work. 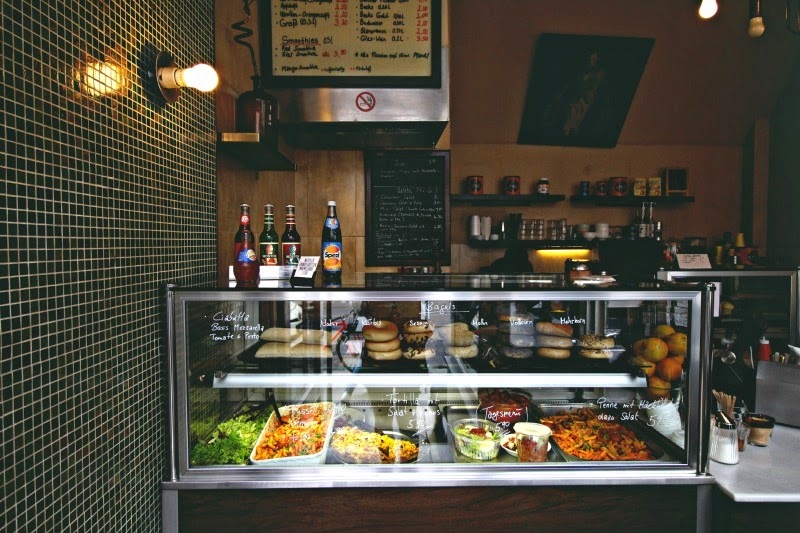 On top of just bagels, there is also a wide selection of sandwiches and Turkish delights that will be sure to suit your fancy. 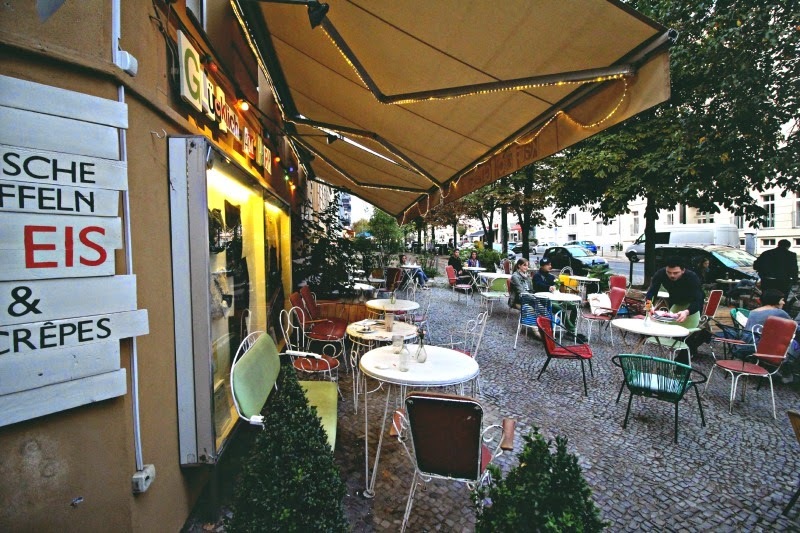 The place is pretty tiny, so if the weather is nice, take your bagel to a park down the street in Mitte and watch the pretty locals and confused tourists make their way across town. 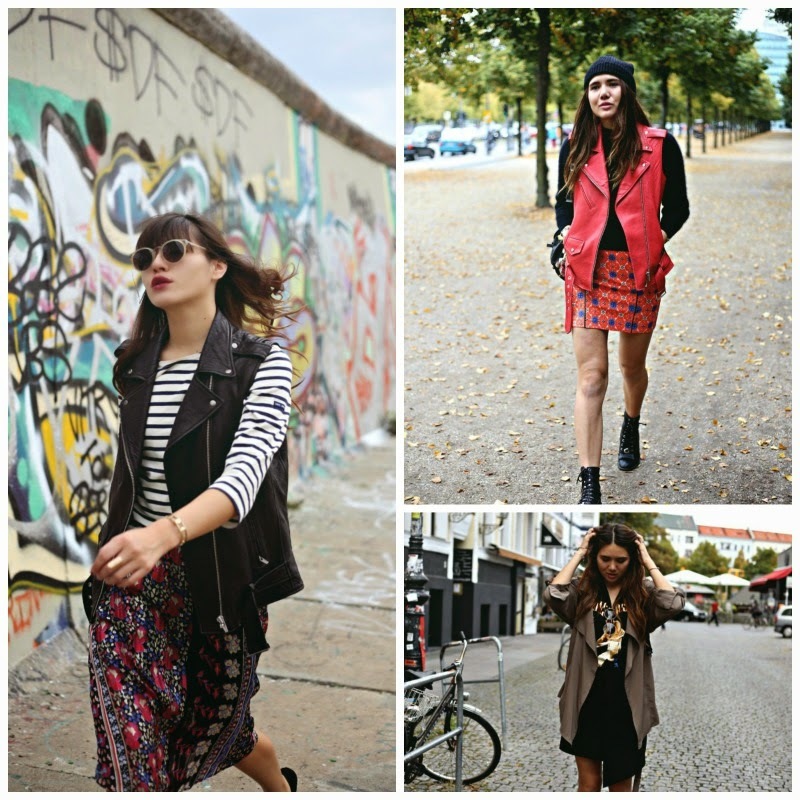 And more posts to come on what we wore in Berlin, featuring Forever 21! But here's a sneak peek for now :) More to come! what a cool place! I wanna go so badly! what a trip! love all the photos! Fantastic guide and wonderful photos! 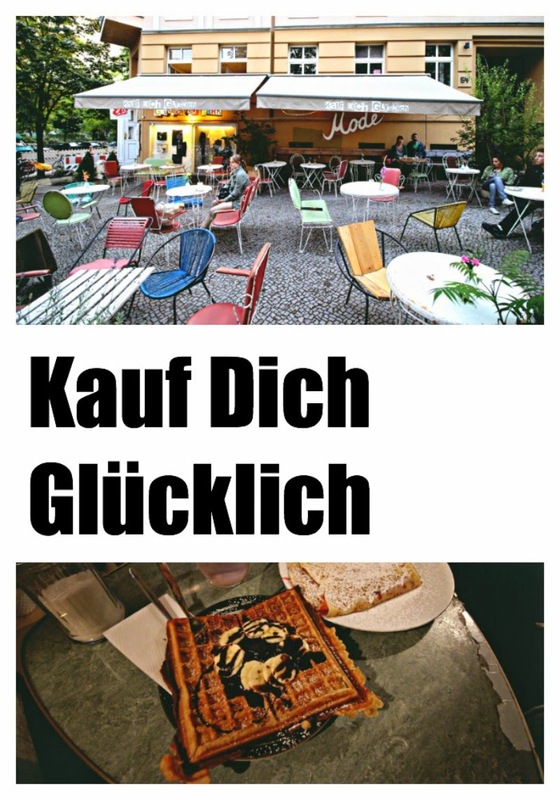 I'll definitely check out some of these places when I get to visit Berlin. Amazing photography! And I am absolutely smitten with Natalie's skirt! Both of your style is always on point. This place looks fabulous, I love this! these photos are amazing!!! 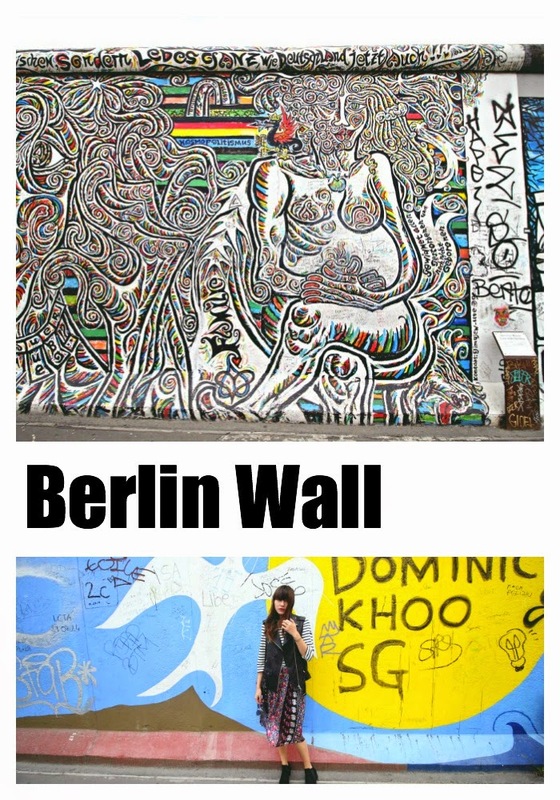 i definitely need to visit Berlin! amjazing and so beautiful clothings and food. This is amazing! Loved your guide to Berlin! Must visit in the future!